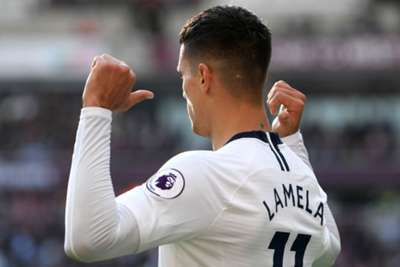 Erik Lamela continued his fine run of form as he scored the winning goal in Tottenham's 1-0 London derby triumph away to West Ham on Saturday. The Argentina international was often a nuisance to the Hammers defence and he got himself a deserved goal just before the break, adding to the six goals and three assists he accumulated in his previous eight games across all competitions. Spurs just about edged an unremarkable first half, with Lamela breaking the deadlock on the stroke of half-time with a neat header. West Ham offered a little more going forward after the break and did threaten through Marko Arnautovic, but at no point did Spurs appear to be struggling with the pressure and they held on to move up to third at least for a few hours. After an uneventful start, Harry Kane was the first to threaten either goal just before the half-hour mark, before West Ham lost Andriy Yarmolenko to an innocuous-looking heel injury. Things soon got worse for the hosts as Lamela found the net with a glancing header from Moussa Sissoko's left-footed cross. Spurs almost got a second a few moments later, but Lukasz Fabianski pushed Lamela's shot away and then Davinson Sanchez hit the rebound straight at the goalkeeper. Hugo Lloris had to be alert early in the second period, as he clawed an Arnautovic header away from his top-left corner. The Frenchman denied Arnautovic again in the 60th minute, tipping his low 20-yard drive wide of the mark, shortly before the forward was involved in a brief altercation with Sanchez. Javier Hernandez – returning after more than a month out with an illness – had a late goal disallowed for offside before Lloris made another save from Arnautovic to secure the points. West Ham's problem on Saturday was undoubtedly a lack of creativity through the middle. Felipe Anderson and Yarmolenko were both quiet before their respective withdrawals, with Arnautovic – their central striker – the only one offering a bit of ingenuity on occasion. Although the match was more notable for rugged tackles and physical battles, Lamela offered a touch of class. He found the net with a well-taken header, while he was generally a threat on the ball with his dribbling and creativity. For all his running and hassling, Noble was poor against Spurs' midfield. On several occasions Lucas and Lamela were able to surge away from him, and he received a booking for a nasty tackle on the latter. - West Ham are winless in eight Premier League London derbies since beating Chelsea in December 2017 (D5 L3). - Tottenham have won five consecutive top-flight London derbies for the first time since January 1961, a season in which they won the First Division. - West Ham have earned seven points from their opening nine games of the season, their worst return at this stage since 2010-11 (six points) when they finished bottom. - Spurs have won nine of their last 12 Premier League away games (D1 L2), including five of their six on the road this season. - Erik Lamela has scored five goals in eight games in all competitions for Spurs this season, one more than he managed in 33 games last season. West Ham travel to Leicester City in a week's time for their next Premier League outing, while Spurs – who face PSV away in the Champions League on Wednesday – host Manchester City in a tantalising fixture on Monday October 29.